University of Cincinnati alum (and former <i>Cincinnati Magazine</i> intern!) 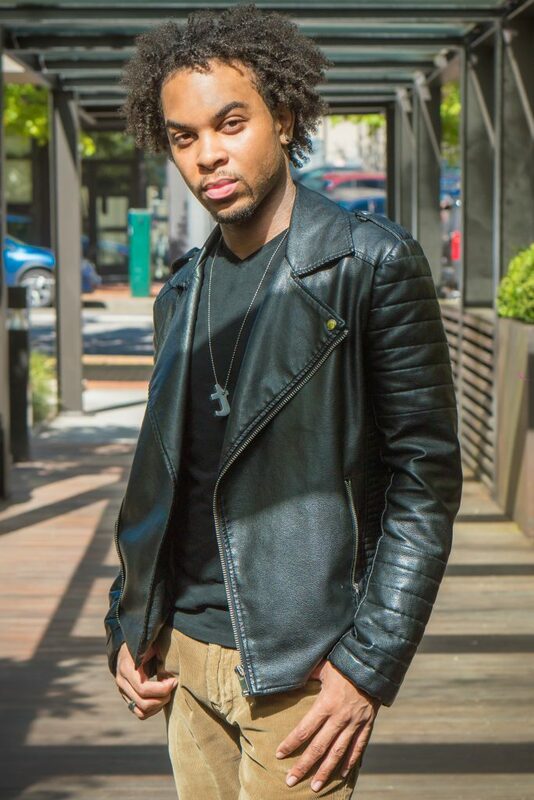 Terron Austin was recently back in town as part of Nedda Stella, the background vocalist group for R&B/soul powerhouse Erykah Badu’s headlining set at Cincinnati Funk Fest. He’s currently on tour with Badu in support of the 21st anniversary celebration of her Grammy Award–winning debut album Baduizm. We talked to Austin about his journey from the Queen City to the Big Apple, singing behind one of music’s most sublime talents. CM: I remember from way back when—around 2005 or 2006—that you have a beautiful singing voice! That was when you were a student at University of Cincinnati. Was singing always something you saw yourself doing as a career? Austin: Yes! Absolutely! You know how you sometimes have those kinds of larger-than-life dreams that not everyone around you even comprehends? This has certainly been one of them since I was a child singing in church and hanging around recording studios. I even strategically made sure that my career choices prior to this kept me surrounded by music and the entertainment business. You could always find me consumed by music: as a songwriter; a multimedia journalist working for urban radio stations, television, and magazines across the country; as an artist’s assistant for various concerts in and around Cincinnati; and even being an avid concert roadie. Every step I took seemed to quietly bring me closer and closer to it. I always said I’d do this even when others didn’t believe what I could see, but I just never knew exactly how and when it would happen. In this case, the preparation met the opportunity so I jumped at the chance to live out that dream in front of the world. CM: How did you meet Erykah Badu? Austin: I’d always been a super fan of Auntie E. (my nickname for her) since she debuted back in 1997. I’ve traveled to and attended more shows than I can count over the years during every album cycle and tour so I became a bit of a familiar face. Ironically, Erykah had only heard me sing once at Cincinnati Music Hall on New Years’ Eve in 2010 during a random mic toss at the end of the show. I remember I made my way to her from the audience to do a vocal tag on the end of “Bag Lady.” I’d even served as Erykah’s assistant during the Macy’s Music Festival the year she was the last-minute surprise guest in place of Jill Scott. CM: How did you officially get hooked up to sing with her? Austin: What made this gig official was a phone call early in the morning from another band member on August 9, 2015, while I was stuck in the airport in Atlanta trying to get home the week before I was set to begin graduate school in New York City. Erykah was looking for a replacement vocalist and I was told if I could get to the next show in Portsmouth, Virginia, where they were headed, then I was in. They were boarding their flight when the call first came through so I figured it’d be easy to reroute my original flight from Atlanta to New York to make the gig. However, three of the four morning flights were oversold and the last one wouldn’t get me there in time for the sound check or at least a full rehearsal. Forfeiting the opportunity was completely out so I decided to listen to my bootleg copies of recent shows and rehearse on my own as I made the nine-and-a-half-hour drive, breaking every speed limit between Georgia and Virginia. CM: So did you make it?!? Austin: Miraculously, I arrived within 15 minutes of performance time, but I had to borrow one of the other vocalist’s extra show clothes since my luggage went to Newark. I warmed up in the bathroom then prayed with Erykah and Nedda Stella. I said an extra prayer as we were rushed to the stage and God must’ve heard me praying all day because everyone in the band and crew said I absolutely nailed the show. When the show was over, Erykah looked me directly in my eyes, pleased with my knowledge of the spontaneity of her entire set, and said to me “I can tell you wanted this bad enough so you’re in.” Of course, I burst into tears of joy and the rest is history because I’ve been with her ever since. CM: Does touring conflict with you being in graduate school? Austin: I finessed my way through two grueling semesters of grad school before our tour schedule intensified and I had to make a decision to sit out my last semester. But I do plan to finish my master’s in arts/entertainment reporting with a focus on film and documentary very soon. CM: How is singing for a living different from any other career you’ve had? Austin: Personally, it’s a lot more fulfilling. I’ve witnessed or been involved in all the other aspects of what goes into show business—from the promotion of the record, booking and organizing a world tour on up to staging or producing the actual show. Even my days of servicing singles to radio and retail, tracking chart updates, building press opportunities, or conducting interviews is all the summation of what an entertainment journalist and music junkie like me lives for from day to day. Studying the business of music and navigating the rapid changes in the music industry has also provided some serious experience all across the board. Now, I get to sing songs I loved or knew were hits back then that I hadn’t yet lived through. I’m so much more appreciative of their meaning and the lessons in the art Erykah creates. I’m grateful to be a part of something much bigger than me when I remember what it felt like just a few years ago to experience a live concert or spend your last dime just to see your favorite artist in person hoping you’ll meet them one day. CM: What do you do as a singer that people in other jobs might not think about? Austin: You quickly learn how to shut up after a show so you can rest your voice between flights, get the proper amount of sleep in sometimes near impossible instances during back-to-back dates. You learn to drink tons of water and eat healthy to take care of your instrument in order to give the best possible experience to the audience. CM: What’s an Erykah Badu live show like from where you’re standing? Austin: For us, no two shows are ever the same so you always have to be present in the moment being created. There’s also something about that adrenaline rush before every show. Even when you’re homesick or sleep deprived, there’s nothing like hearing the roar of a crowd when the lights go dim and the curtain rises. They’re expecting something magical. It’s magical witnessing it and being part of it, too. CM: What’s been your favorite place to perform and why? Austin: The Badu vs. Everythang Tour 2017 A.D. was my first time overseas. We spent most of last summer trekking throughout Europe performing before sold-out audiences in cities on my bucket list like London, Paris, Copenhagen, Rotterdam, and Lucca, Italy. My favorite place amongst those would have to be the Montreux Jazz Festival in Montreux, Switzerland. It was absolutely breathtaking to wake up every day right on Lake Geneva. CM: What was the most surprising moment from that tour? Austin: British electronic soul singer Sampha and the brilliant Grammy Award–winning artist Solange both opened for us. While watching Solange perform, I realized I was standing beside the legend himself, Mr. Quincy Jones. We had no idea he was going to stay to watch our show and since I’m furthest to the right on stage, I could sneak glances at him enjoying every moment, nodding his head and tapping his feet to the beat and later giving us the thumbs up during each of our solos. After our show, he took pictures with each of us and we were able to sit at his feet and soak up some rare gems. He was so proud of each of us. He had very specific notes on what he heard in our techniques and individual styles. He told us singers, “the future of music is in good hands because of you.” That kind of thing just doesn’t happen every day. Like for real? Mr. Quincy Jones saw and heard me sing then told me how dope I was afterwards? I’ll remember that for the rest of my life. CM: Are there any ways that New York is similar to Cincinnati? Austin: Oddly enough New York is becoming similar to Cincinnati now because I’ve frequently run into a lot of people who have moved from here to NYC. It’s funny to me because I sometimes think to myself didn’t I move to get away from y’all? On a serious note, Cincinnati will always be home so I’m excited about this Funk Fest show because I get to represent for the ’Nati and stop to remember this is where it all started for me. CM: Is there anything you miss about Cincinnati? Austin: Yes! Grippo’s Bar-B-Q potato chips, Gold Star Chili, and LaRosa’s Pizzeria because I cannot stand pizza in New York! It’s dirt cheap to get it by the slice, but it’s thin crust and tastes like paper to me. Nobody does pizza sauce like LaRosa’s back at home in Cincinnati. When I get off the plane I’m going to get all of my favorites plus Alabama Fish Bar on Race Street knows my order already, too—two whiting filets and fries on white bread with grilled peppers and onions topped with malt vinegar, yellow mustard and hot sauce. (Horrible that I all I want to do is eat, right?) Oh, and even though I don’t drink it often, the Midwest has the best pop—Tahitian Treat. New Yorkers get mad at me because I’m constantly arguing that caffeinated beverage is referred to as pop, not “soda.” Think about it. If I say soda, how do you know which one to bring me?! Besides food, I definitely miss my family from time to time. Being the oldest grandchild, I’m the one that moved away first so I try not to be gone for more than six to eight months before I make a visit back home or at least make time in other cities to connect with family that lives wherever we’re performing. I’ve missed a few childbirths and other special occasions being on the road, but they know I’m there in spirit and I’m out here having the time of my life. CM: What’s up next for you? Austin: With Erykah and Nedda Stella, we’re in the middle of another big year of touring. We’re set to headline the 2018 Essence Music Festival in New Orleans during Fourth of July weekend. I’ve never been so I’m pretty excited about that one. We’re also headlining Afropunk in my backyard in Brooklyn this August alongside Janelle Monae, Lion Babe, and Miguel. It’s one of my favorite festivals to attend. Then it’s off to another dream destination Johannesburg, South Africa, in September so I’m ecstatic that I get to take advantage of a real-life Wakanda experience. That trip is going to be a self-fulfilling prophecy because I had some very vivid dreams about visiting Africa long before I heard we were going and long before Black Panther demolished the box office records during Black History Month. God is so good! CM: You have any plans to strike out on your own? Austin: I’m developing my sound while working with a few artists, producers, and musicians I respect so my prayer is that the next time I come home to perform, it’ll be because someone booked me, too. Look out for that very soon by staying connected to me via all social media platforms: @TerronAustin. Austin: I’m also writing and pitching a passion project that’s near and dear to my heart—a film/documentary idea I’ve had since I started graduate school the year I began touring. This year will also see the establishment of my brand in the world of visual art. There’s a lot happening right now and I’m just blessed to be in the position I’m in to inspire others to dream out loud. Do whatever it takes. If you have to walk, run or even crawl, find a way to get there by any means necessary because it can and it will happen. If you stay ready, you won’t have to get ready and I mean that. Oh, and to all of my friends and family who are hitting me up at the last minute trying to get into the Cincinnati Funk Fest, I’m out of comp tickets so I hope you’ve got your seats purchased! This is going to be a great show and I hope to see you all soon for pictures, hugs, and kisses. Thank you all for your continued love, support and prayers!